Ok, we all know about The Bible (thank Marta and Fellini), but is there any other promotional material about Madlax out there? I've seen pictures of some action figurines in the Google image search, does anyone know more about those? Ok, I've researched the issue a bit myself and found out that there is, actually, only one Madlax resin model kit - called "Madlax with guns". At least, it is the only one I've found so far that was referenced in English (and even German). However, there is also another one, apparently, but it hasn't had much attention paid to it... AFAIK it is only mentioned on Japanese blogs. Does anyone here knows Japanese well enough to translate that for me? I remember seeing the figurine kit at one time. I think either the Japanese OST or the extended singles discs had special editions that came with little mousepads. I only managed to snag one of the special editions with the "LAX" half mouspad. I've actually been using it, so it's a little beat up. Besides the Bible, nothing else exists as far as I can tell. Hum, anyone here plans to buy the "Complete Collection"? My, is it yellow... Helianthus? Enticement?.. Hey, do I look like someone who has enough cash to preorder anything overseas? Well, except Dreamfall Chapters, maybe... but they are produced in Norway, which is essentially around the corner here. isn't bad either. Sure beats Amazon and ADV though. I also plan to keep an eye on Right Stuf and ADV because they might offer their remaining regular DVDs on special sale so keep your eyes peeled. Just imagine Revoltech Madlax or Noir figures? My credit card would never know what hit it. The last link is posted on Wikipedia. 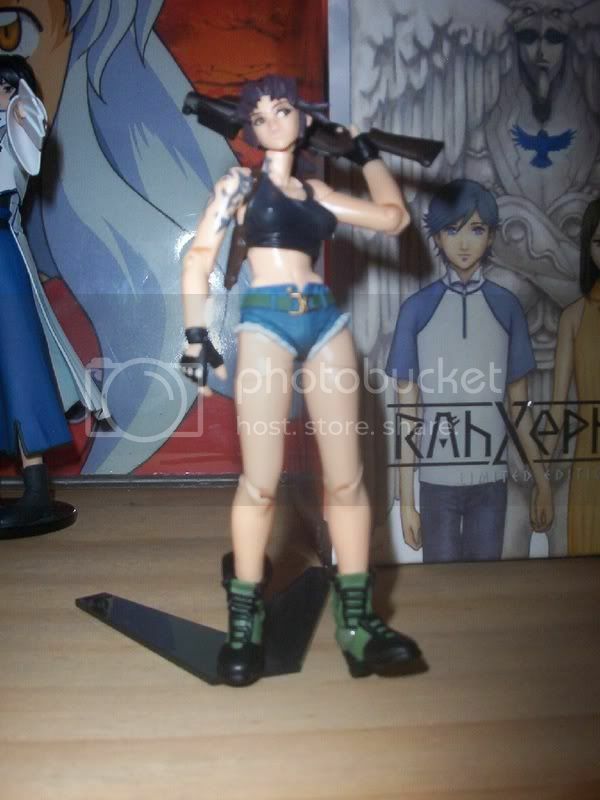 I've seen the Madlax resin figure too but it would take luck, $$ and someone way more talented at painting to make it look good so I'll rather have either gashas or action figures. I still have a Soulcalibur resin figure in its box waiting to be assembled and painted. The Revoltech ones are really good because they're very poseable and detailed. Right now my Revy figure is kneeling hiding beside the RahXephon movie artbox. The Revoltech ones are really good because they're very poseable and detailed. Ah, okay, now I understand! My knowledge of the "collectables" arena is sorely lacking. Not that I'm going to change that anytime soon, as I think I'm spending enough money on this obsession as it is! I hope they don't mind I'm neither a dad nor a grad.